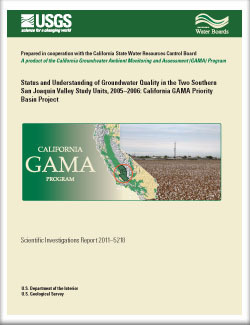 Groundwater quality in the southern San Joaquin Valley was investigated from October 2005 through March 2006 as part of the Priority Basin Project of the Groundwater Ambient Monitoring and Assessment (GAMA) Program. The GAMA Priority Basin Project is conducted by the U.S. Geological Survey (USGS) in collaboration with the California State Water Resources Control Board and the Lawrence Livermore National Laboratory. There are two study units located in the southern San Joaquin Valley: the Southeast San Joaquin Valley (SESJ) study unit and the Kern County Subbasin (KERN) study unit. The GAMA Priority Basin Project in the SESJ and KERN study units was designed to provide a statistically unbiased, spatially distributed assessment of untreated groundwater quality within the primary aquifers. The status assessment is based on water-quality and ancillary data collected in 2005 and 2006 by the USGS from 130 wells on a spatially distributed grid, and water-quality data from the California Department of Public Health (CDPH) database. Data was collected from an additional 19 wells for the understanding assessment. The aquifer systems (hereinafter referred to as primary aquifers) were defined as that part of the aquifer corresponding to the perforation interval of wells listed in the CDPH database for the SESJ and KERN study units. The status assessment of groundwater quality used data from samples analyzed for anthropogenic constituents such as volatile organic compounds (VOCs) and pesticides, as well as naturally occurring inorganic constituents such as major ions and trace elements. The status assessment is intended to characterize the quality of untreated groundwater resources within the primary aquifers in the SESJ and KERN study units, not the quality of drinking water delivered to consumers. Although the status assessment applies to untreated groundwater, Federal and California regulatory and non-regulatory water-quality benchmarks that apply to drinking water are used to provide context for the results. Relative-concentrations (sample concentration divided by benchmark concentration) were used for evaluating groundwater. A relative-concentration greater than 1.0 indicates a concentration greater than the benchmark and is classified as high. The relative-concentration threshold for classifying inorganic constituents as moderate or low was 0.5; for organic constituents the threshold between moderate and low was 0.1. Aquifer-scale proportion was used as the primary metric for assessing the quality of untreated groundwater for the study units. High aquifer-scale proportion is defined as the areal percentage of the primary aquifers with a high relative-concentration for a particular constituent or class of constituents. Moderate and low aquifer-scale proportions were defined as the areal percentage of the primary aquifers with moderate and low relative-concentrations, respectively. Two statistical approaches—grid-based and spatially weighted—were used to evaluate aquifer-scale proportions for individual constituents and classes of constituents. Grid-based and spatially weighted estimates were comparable for the two study units in the southern San Joaquin Valley (within 90 percent confidence intervals). The status assessment showed that inorganic constituents were more prevalent than organic constituents and that relative-concentrations were higher for inorganic constituents than for organic constituents. For inorganic constituents with human-health benchmarks, the relative-concentration of at least one constituent in the SESJ study unit was high in 30 percent of the primary aquifers. In the KERN study unit, the relative-concentration of at least one constituent was high in 23 percent of the primary aquifers. In the SESJ and KERN study units, the inorganic constituents with human-health benchmarks detected at high relative-concentrations in more than 2 percent of the primary aquifers were arsenic, boron, vanadium, nitrate, uranium, and gross alpha radioactivity. Additional constituents with human-health benchmarks—antimony, radium, and fluoride—were detected at high relative-concentrations in the KERN study unit. For inorganic constituents with aesthetic benchmarks (secondary maximum contaminant levels, SMCLs), the relative-concentration of at least one constituent in the SESJ study unit was high in 6.6 percent of the primary aquifers. In the KERN study unit, the relative-concentration of at least one constituent was high in 22 percent of the primary aquifers. Inorganic constituents with aesthetic benchmarks detected at high relative-concentrations in the primary aquifers in the SESJ and KERN study units were iron and manganese. Additional constituents with aesthetic benchmarks—total dissolved solids (TDS), sulfate, and chloride—were detected at high relative-concentrations in the KERN study unit. In contrast, the status assessment for organic constituents with human-health benchmarks showed that relative‑concentrations were high in 3.6 percent and 2.1 percent of the primary aquifers in the SESJ and KERN study units, respectively. The special-interest constituent, perchlorate, was detected at high relative-concentrations in 1.2 percent of the primary aquifers in the SESJ study unit. Twenty-eight of the 78 VOCs (not including fumigants) analyzed were detected. Of these 28 VOCs, benzene had high relative-concentrations in the SESJ study unit, and relative‑concentrations for the other 27 VOCs were moderate and low. Five of the 10 fumigants were detected; 1,2-dibromo-3-chloropropane (DBCP) was the only fumigant with high relative-concentrations in the SESJ and KERN study units. Of the 136 pesticides and pesticide degradates analyzed, 33 were detected. Human-health benchmarks were established for eighteen of the detected pesticides. Dieldrin was detected at moderate relative-concentrations in the SESJ and KERN study units. All other pesticides detected with human-health benchmarks were present at low relative-concentrations. The detection frequencies for two of these pesticides—simazine and atrazine—were greater than or equal to 10 percent in the SESJ and KERN study units. The understanding assessment of groundwater quality included an analysis of correlations of selected water-quality constituents or classes of constituents with potential explanatory factors. The understanding assessment indicated that the concentrations of many trace elements and major ions were correlated to well depth, groundwater age, and/or geochemical conditions. Many trace elements were positively correlated with depth. Arsenic, boron, vanadium, fluoride, manganese, and iron concentrations increased with well depth or depth to top-of-perforations. The concentrations for these trace elements also were higher in older (pre-modern) groundwater. In contrast, uranium concentrations decreased with increasing depth and groundwater age. Most trace elements were correlated to geochemical conditions. Arsenic, antimony, boron, fluoride, manganese, and iron concentrations generally were higher wherever the pH of the groundwater was greater than 7.6. Concentrations for these constituents generally were higher at low concentrations of dissolved oxygen (DO). Uranium was the exception; uranium concentrations generally were lower at high pH and at high concentrations of DO. Nitrate concentrations generally were lower in deeper wells. Nitrate concentrations also were higher in groundwater with higher DO. Total dissolved solids, sulfate, and chloride concentrations were higher in the KERN study unit than in the SESJ study unit. Total dissolved solids were negatively correlated with pH in the KERN study unit. Total dissolved solids and sulfate were higher in areas with more agricultural land use. Chloride concentrations increased with depth to top-of-perforations in the KERN study unit. Organic constituents and constituents of special interest, like many inorganic constituents, were correlated with well depth, groundwater age, and DO. Unlike most trace elements, however, solvent and pesticide detections, and total trihalomethanes (THM), DBCP, and perchlorate concentrations decreased with increasing well depth. Volatile organic compound, solvent, and pesticide detections, and THM concentrations also were lower in older (pre‑modern) groundwater than in modern-age groundwater. Solvent detections and total THM, DBCP, and perchlorate concentrations increased with increasing DO concentrations. Burton, C.A., Shelton, J.L., and Belitz, Kenneth, 2012, Status and understanding of groundwater quality in the two southern San Joaquin Valley study units, 2005–2006—California GAMA Priority Basin Project: U.S. Geological Survey Scientific Investigations Report 2011–5218, 150 p.